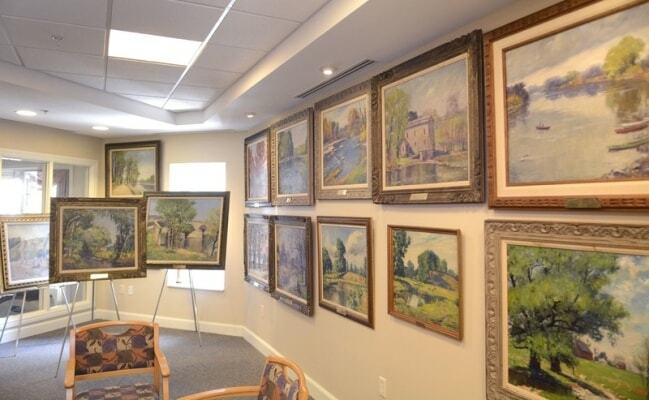 Since the board of directors for the Peabody Home Foundation voted to auction off its collection of paintings by the renowned Indiana impressionist Homer Davisson, there have been a few types of responses, says Stan Williams, director of development for the Peabody Home Foundation. With the auction taking place Saturday, Williams says there are the ecstatic collectors and intrigued curators, the frustrated resellers who fare better when paintings are scarce, and then there are the people disappointed to see a large collection of Davisson’s paintings separated into auction lots after being housed on Peabody’s North Manchester campus for more than 45 years. Davisson died in 1957 at 91 years old. His wife, Elizabeth “Bess” Davisson, moved to Peabody in 1963 and donated Davisson’s work from her personal collection. She died in 1970. The couple did not have any children. Davisson was well-known for his Indiana landscapes. Bids for the majority of his paintings begin at $2,400, except for “Woman Boating on River,” which starts at $5,000. Williams said money from the auction will establish the Homer G. and Elizabeth Davisson Memorial Chapel endowment to commemorate the couple’s Presbyterian faith; the endowment will support its maintenance and programs for the chapel. Fort Wayne Museum of Art Executive Director Charles Shepard says that although the museum has eight or nine Davisson paintings in its collection, having such an unusually large number of the artist’s work entering the market at one time does pique his interest. Shepard says one reason why buyers don’t see a large number of paintings by the same artist in a single auction is that the abundance of material can detract from its rarity and drive prices down. This auction could possibly be a bargain for buyers, he says. “You could probably guess – at least I think so, anyway – that his wife probably would have had some of his best work,” he says. But Shepard says getting the paintings into institutions and into the hands of good, private collectors could stir up some new energy for Davisson’s work. “It’s going to be good for how he’s remembered in the long run as an artist. Twenty-one good works can change a lot of opinions,” Shepard says. Davisson grew up in Blountsville, developing his art skills at an early age. He studied at DePauw University and refined his talent at art schools in the U.S. and Europe. Settling in Fort Wayne in 1911, Davisson began teaching at the Fort Wayne Art School, where he would work for 30 years. In his free time, Davisson began making trips to Brown County. He met Elizabeth, a high school English teacher, during one of his trips. The couple married in 1926. The Davissons maintained a studio behind their home in Fort Wayne and another at their summer home in Somerset, a township south of Wabash. Williams says a majority of Peabody’s collection features images of Somerset and the nearby Mississinewa River. As for the auction, Williams says he hasn’t dwelled on a specific dollar amount he would like the foundation to bring in, mainly because he would like to sleep peacefully until Saturday. But he guarantees that Homer and Elizabeth Davisson’s legacy will live on. He says local company Century Imaging has taken photos of the Peabody’s Davisson collection, and the prints will now hang in the hallways.